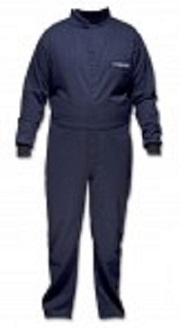 These arc flash coveralls are the safest, most comfortable, light-weight, and most durable found anywhere today. With an incredible price point you get the finest AMERICAN MADE Arc-Flash rated safety clothing constructed from the highest quality materials available to ensure your overall safety. 30 - 32" XS 36"
34 - 36" S 40"
38 - 40" M 44"
42 - 44" L 48"
46 - 48" XL 52"
50 - 52" 2XL 56"
54 - 56" 3XL 60"
58 - 60" 4XL 64"
Short (5'2" - 5'6") sleeve 30", trunk 28", inseam 28"
Regular (5'7z" - 5'11") sleeve 32", trunk 30", inseam 30"
Tall (6' - 6'2") sleeve 34", trunk 32", inseam 32"
Extra Tall (6'3" - 6'5") sleeve 36", trunk 34", inseam 34"
Comes in Protera® (Standard). Also available in Indura Ultra Soft®.